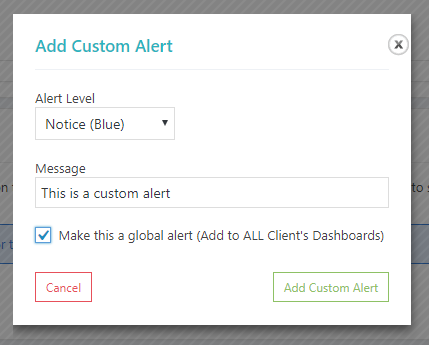 The Custom Alerts feature allows you to add alerts / warnings / notices to the client dashboard. You can add alerts for individual clients or or make them global so that they show on the dashboard of every client. The alerts record when they have been “seen” and also whether or not the client has “cleared” (deleted) the alert. Click the Add Custom Alert button and you’ll be presented with a modal to add your alert. You can choose an alert level, add a message and choose whether or not to make it a global alert. As you can see, you’re able to edit / delete the alert and you can see whether or not the alert has been “seen” & “cleared”, as well as whether or not the alert is global. It also gives a coloured preview of what the alert will look like on the client dashboard. TIP: If you delete or edit a global alert from within any client admin page, it will affect the alert for all clients. As you can see, the alerts show at the top of the page where are most likely to be seen and can be “cleared” by clicking the X on the right hand side of the alert. Now the client has seen and cleared the alert, we can go back to the admin side and see the date / time of when the client has both “seen” and “cleared” that particular alert.